Adding Notes is an easy and useful way of recording information against a contact, child or giver. 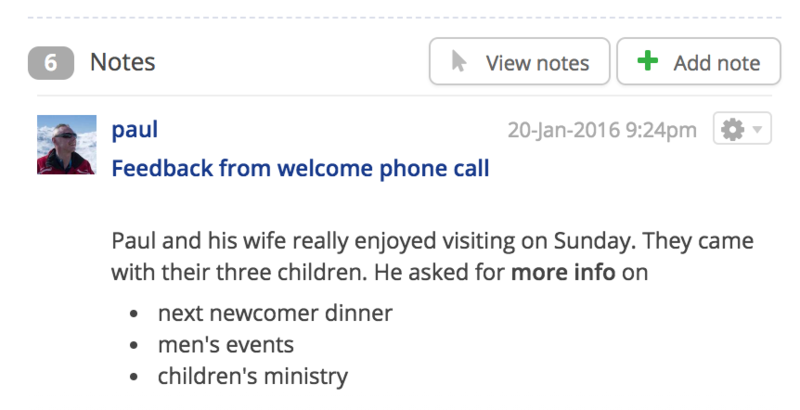 Notes can also be added against events, small groups, ministries, and bookings. 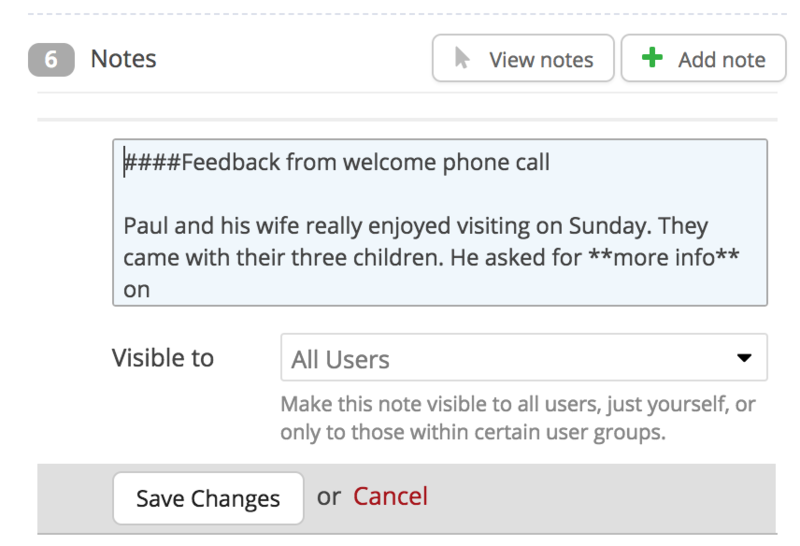 Notes never show in the member-facing My ChurchSuite; they are a function of the admin-facing system only and are therefore only visible to users, not members. By default, Notes are visible to All Users. However it's also possible to restrict the visibility of a note at the time of adding it; either to a specific group of users, or to make them private, visible only to the author. Notes are date and time stamped and clearly show who recorded or edited the Note. Before saving a note, you can optionally restrict its visibility - either the default All Users, or a more private, Just Me. 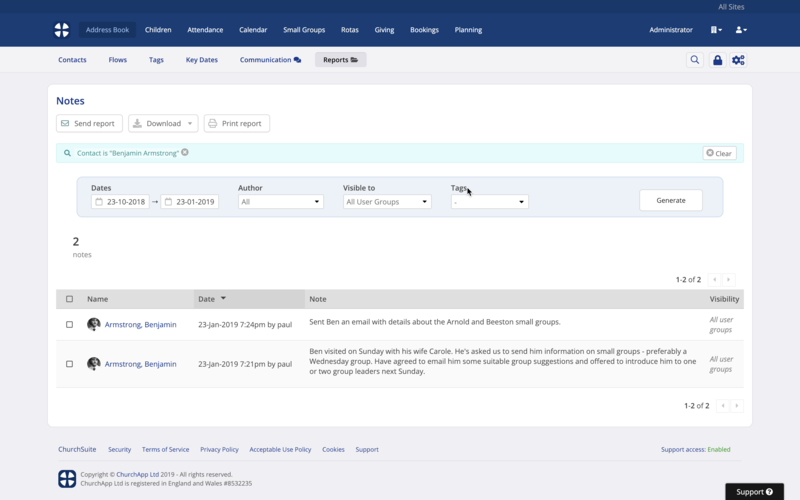 It's also possible to restrict visibility to one or more User Groups (See the related support article for guidance on creating user groups). Finally, click Add note to save it. 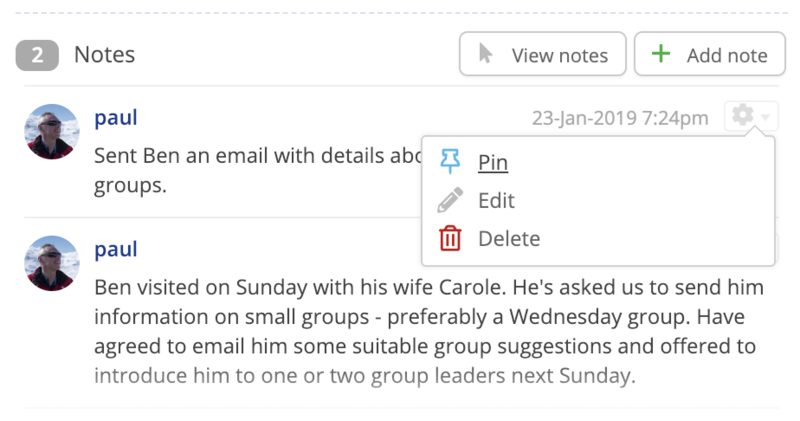 It's also possible to Pin important notes to the top of the list - pinned notes remain at the top of the list so that they're always seen, and can be unpinned again if necessary. Once unpinned, the note takes its place back in the date order of the other notes. 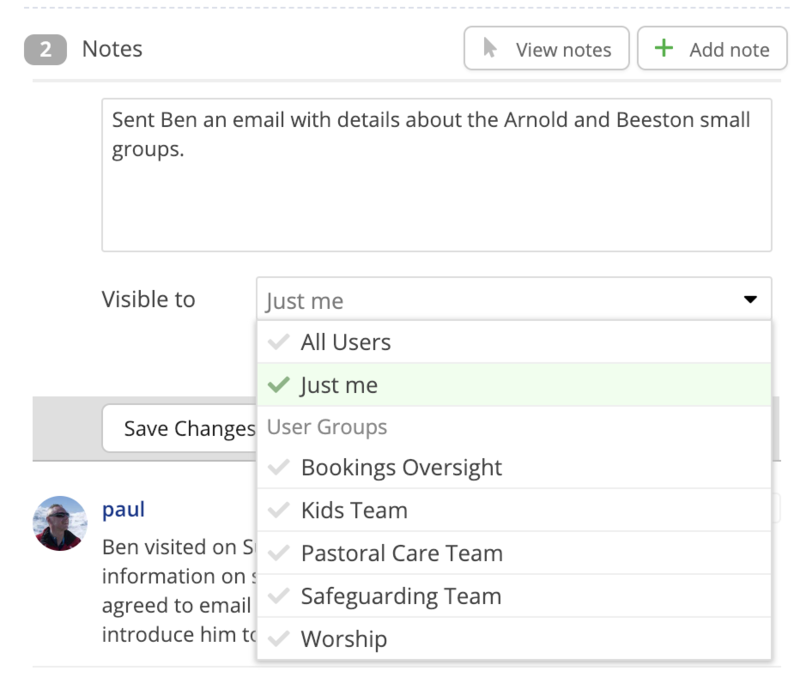 By default, Notes are set as visible to All Users of your admin-facing system (never to church members). The Note is always linked to the staff member (User) who made it, so everyone knows who wrote it. But what does All Users mean? Essentially it means every other user with permissions for the module in which the note is added. 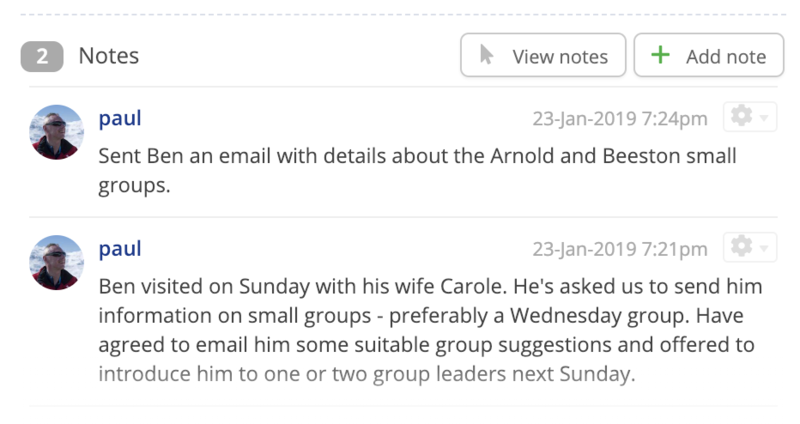 What's useful about All User notes is that when communicating or dealing with church members, all your team are able to work more collaboratively and stay on the same page pastorally, rather than sending inconsistent communications or not knowing the full picture. 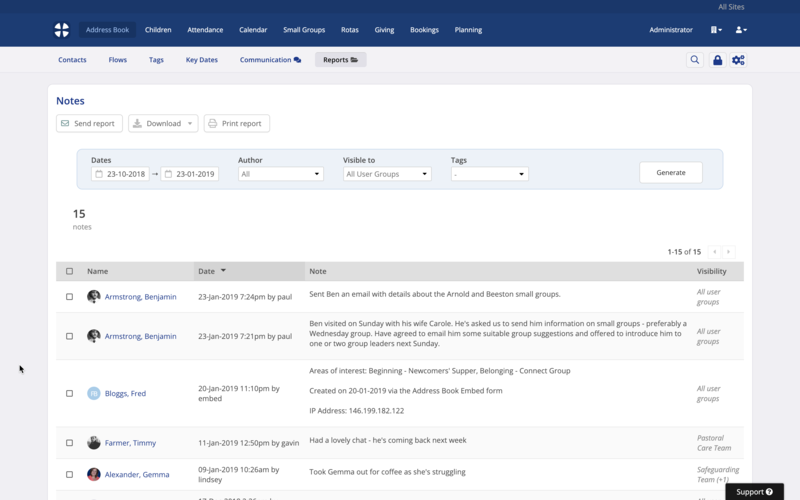 Using the Notes report, located in the Reports section of most modules, you can view all the notes made within that module - ideal for catching up on what's been happening after a period of absence or leave. 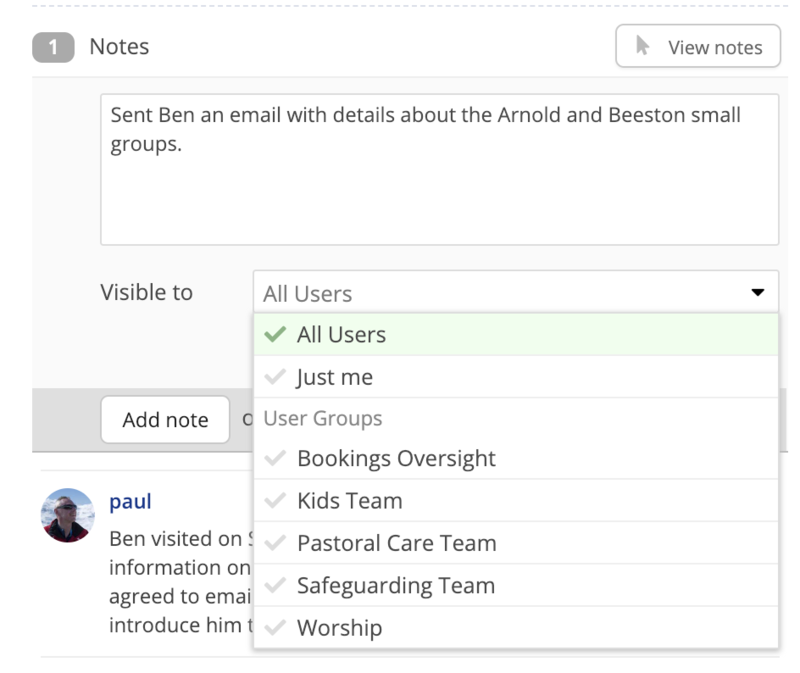 Private Notes in ChurchSuite can only be seen by the user that wrote them. In other words, if a pastor in your church adds a private note against an individual in the Address Book, other pastors (or indeed any other User) will not be able to see it and will not even know that a note has been made. What's useful about private "Just me" Notes is that the Note stays confidential, so it can be used by a pastor wishing to make notes that might contain sensitive pastoral information. Equally, it could just be that the user making the note simply want to be reminded of something before the next time they contact a person! To make a note private, change the Visible to option to Just Me. In addition to private and public notes, you can also restrict visibility to one or more groups of users - User Groups - so that only a user who is a member of that user group is able to view, edit, delete or pin the note. 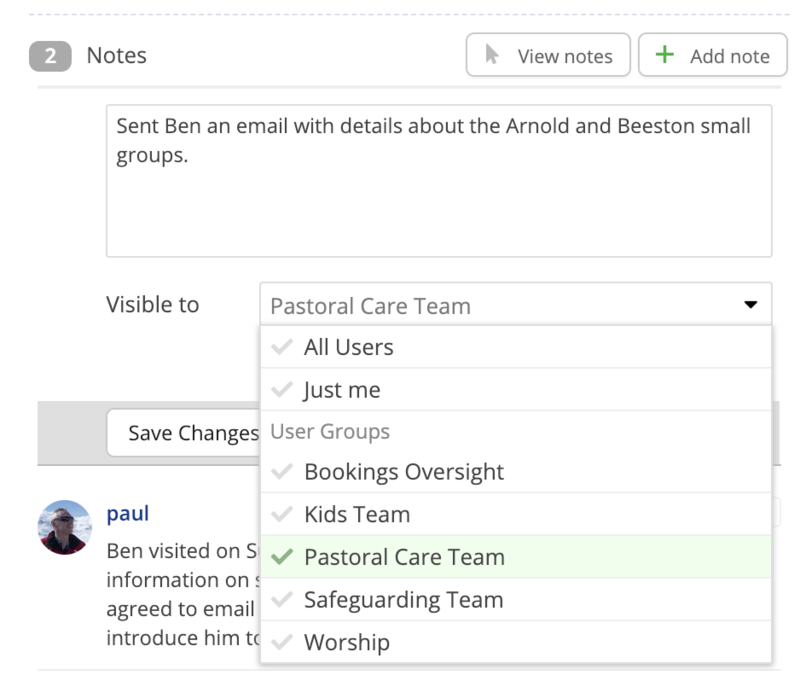 For example, you might have a "Pastoral Bereavement Team" User Group who record sensitive notes that they wish to be visible only to others user who are in that pastoral user group. ...and a filtered Notes report is displayed for that person. The report can then easily be downloaded to a CSV or PDF format report, or printed. The Notes report includes batch Actions functionality, allowing a user to select one or more notes, or even all notes, and then batch Delete the selected Notes. It may be helpful to create a user account that exists for the sole purpose of data protection enquiries, such as Subject Access requests and Freedom of Information requests. That user account could be assigned to all your User Groups, so that in the event of a request for information, their user group permissions will always allow them to report on all notes for all user groups. However, this method will not include any user-added notes set as visible to "Just me". Reporting on "Just me" notes will always require each of your users to provide you with a report of all their "Just me" notes. To clarify - for privacy, security and safeguarding - private notes set visible to "Just me" and always and only ever visible to the author - no other user or administrator can ever access those notes. More advanced web users may already be familiar with Markdown. Markdown is a text-to-HTML conversion tool that allows you to type using an easy-to-read, easy-to-write plain text format, and then convert it to structurally valid HTML. Using the special characters of Markdown notation, you can therefore enhance your notes if you wish. Markdown notation allows the following customised content to be added to your Notes. A full list of Markdown notation can be found here.